The first lesson of marketing is that everything you do – every letter, every phone call, every Facebook update – should be considered a marketing opportunity. Using business class email will give your electronic messages a professional look and feel that’s priceless, but which comes at a surprisingly low cost. Ask yourself if you can afford to leave this vital means of communication in the hands of free services with millions upon millions of users and nowhere to turn if something goes wrong. Toolkit offers email hosting that not only looks great but also comes with unbeatable reliability, top-of-the-range support services and the highest levels of security. All this comes for just £5 per month for each mailbox with a suite of added extras that you’ll soon wonder how you ever did without. Every scammer on the web uses the free mail services. An @hotmail.com or @gmail.com address, of course, doesn’t mean you’re flogging the keys to the national bank of Nigeria, but if you want your business to look professional, stable and trustworthy you should think about avoiding them. You need your domain name in your address if you’re to be taken seriously. Beyond this cosmetic advantage, hosted email is safer for you and your customers. Toolkit uses Rackspace hosting and guarantees 100% uptime. You’ll never be without your mail because if there are any problems Toolkit’s staff are at the end of a phone line to help immediately. We’ve all received the odd messages from friends followed by an apologetic ‘I’ve been hacked’ mail. Like the WordPress content management system we discussed in a previous post, popularity has made Hotmail (350 million users) and the like a honey pot for hackers. Just last April, a bug let hackers in and left Microsoft scrambling for a fix. Hosted mail has much better security controls. You’ll also be better protected from spam and viruses. Spam is believed to make up 85% of all email sent, and it’s a time-wasting pain in the inbox. With 45 tests on every email, Toolkit gives you a 98% success rate with its filters, and you can control exactly how they work through an easy-to-use dashboard. Spam will waste valuable time, but a virus can cripple your business, so Toolkit’s hosted mail puts all messages – in and outgoing – through a four stage virus scan to keep you and your customers safe. One of the beauties of Hotmail et al is their universal accessibility. You can keep that with Toolkit’s system, so if you’re out on the road with just a phone you can still use almost every feature of the system. There are a lot of added extras too. List management is a vital marketing tool and that comes as part of the contacts package. A state-of-the-art calendar lets you set up and share your schedule with colleagues. Keep on top of your to do list with the task management system. And, the search feature is fast and accurate. Everything is backed with Toolkit’s Passionate Service promise, quick, helpful support from the people who manage your email services on a daily basis. Toolkit Websites is an expert website design company based in Southampton, Hampshire, UK. Get in touch to see how we can help your business grow. In our Website of the Week blog entry last time, we talked about how Toolkit Websites can benefit larger and or growing companies. However, what Toolkit Websites ultimately specialises in, is supporting the small business man and, as is the case this week, business woman. Our Website of this Week goes to CJ Underwood. The client is a talented novelist who has recently written a historical novel about a heroic woman from Haarlam, a small town in the Netherlands, who raises an army of brave female soldiers to protect their beloved home town from attacking Spanish Invaders. The client was in need of a simple yet unique website in keeping with her budget to set the mood of her book. The purpose of the site was to circulate news of the publication among fans of the genre while giving potential fans and customers the chance to find out about the rich, empowering and historical background of the book and its strong female characters. 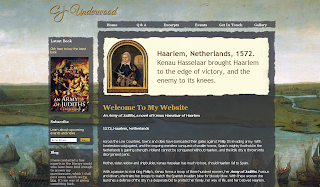 When looking at the homepage of the website, you will first notice the beautiful background, a painting depicting the Battle of Haarlemmermeer, which is the setting of the book. Though the background is set as this simple image, the website user is instantly taken back in time to when the story takes place. Another simple yet effect design choice featured on the website includes the logo, made from basic text but which results in a creative, signature-like effect, appropriate for an aspiring author. Add to that, an aged parchment effect on the edges of the content area and unique, textured Social Media logos and you have a very simple website, that uses modern techniques to construct a very historical experience. The client gave a perfect 5 stars for the build of her site. Toolkit Websites, web designers in Southampton, Hampshire, UK. Get in touch to see how we can help your business grow. Williams Shipping operate a range of marine services including barge and workboat charters across the UK and Europe. They are known for assessing and modernising their equipment and ensure the highest levels of crew training in order to maintain their excellent track record for safety, reliability and quality. For such a large and connected company, they required a website that would give their clients and potential clients the same kind of ease of access to their services and information. 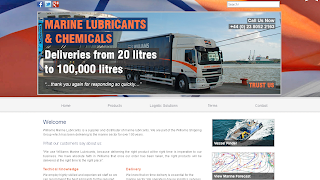 Our Website of the Week is actually one of a group of websites that all stem from one main home site of Williams Shipping. 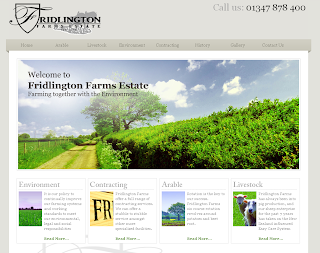 The three websites that we have built for them can be viewed via the links below. As you can see they are all nicely uniform but feature their own specialist content relevant to that particular part of the company as well as small individual design differences that also make each site unique. 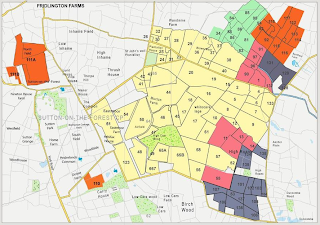 Of course when you have such a large map of information you need a way to make it as easy as possible for your customers to navigate. The Williams Shipping site features a useful Search tool that is available at all times in the header of the website. This search bar will search for any inputted keywords throughout the titles and body of the websites' content and list search results for the viewer to browse. This is a great example of how Toolkit Websites can help even a large-scale company that is made up of many different sectors and areas grow and develop. The internet has made impulse consumers of us all. There is so much choice online that you only have a few seconds to make an impact before your potential buyer is clicking the back button to their search results. If your site fails in any way – it looks bad, a plugin is out of date, there’s an error message – then you’ve lost your chance. Internet marketers call this the bounce rate. Bouncing customers take one look at your site and decide they can do better elsewhere. Good, functional, up-to-date design from Toolkit Websites will keep those visitors sticking. Marketer Carolyn Capern of CT Social has come up with a list of seven problems that could be sending consumers bouncing away from your site. A slow page will lose you business very quickly. No-one waits anymore and they won’t wait for your site. You need quality hosting and a design that works quickly. The world is going mobile and if your site doesn’t work on their tablet or smartphone they’re gone. In just one year the share of site visits from mobile phones has gone up from 5.4% to 10.4% and on tablets it’s jumped from 5.9% to 10.4%. Because of these changes in consumer behaviour we mobile optimise all of our sites and ensure they work with all the operating systems. We also offer a dedicated mobile platform service for those out there who want to go one step further. You – and your designers – shouldn’t forget the prime purpose of your site, which is to interact with customers. If the site is too busy you’ll scare them off. Research shows that autoplay videos and sound clips are especially unpopular and web browsers are coming up with features that will automatically shut off sites with these features. If visitors can’t find their way around without having to think then they’ll go somewhere that is properly signposted and structured. Navigation is key, Google even say that you only have one and a half seconds to 'capture a click' and strong call to actions and clear click-able options on your homepage is exactly how you do this. Believe it or not, some websites actually deliberately use fonts that are hard to read! Your content needs to be written with your audience in mind too, but if readers are squinting to read it, they’ll be bouncing. In a visual medium, you need to look current. Would you shop in a clothes shop which still had last year’s window design? If you don’t look like you mean business, people will assume you don’t. A websites design needs to be revamped and redesigned every 2-3 years at the most in order to remain current. High quality content – well written, relevant, useful – is vital to keeping visitors on your site. And, it needs to be updated regularly too so people will keep coming back to find out what’s new. Toolkit Websites can put you in touch with the best copywriters in the business at special rates for our clients, so if you do need help producing content you’ll get the best, for the best price. It doesn’t matter if most of your sales are made online or you just need a site to send you real life customers, everyone looks online first and you need to have a convincing and compelling presence. Toolkit Websites can help you keep your site relevant and vital for the long term. The Toolkit content management system (CMS) means you’re in charge of what appears under your name and it’s incredibly easy to keep your site updated. With The Toolkit and our continued support and training our designs have a real longevity. We can have the first draft of your brand new site with you in three working days, and we also do special deals on redesigns if you’d just like a few tweaks to keep things looking interesting. Changing your website shouldn’t be a hassle and at Toolkit Websites we do everything to make sure it’s a pleasure. To find out how Toolkit Websites can stop those customers bouncing away just call our expert team on 02380 633 644 and get the website your business deserves. Seymour Hosking call themselves 'IT Systems Doctors' and supply systems and advise blue chip companies and household names all over Britain. They understand that computers and technology can be confusing and overwhelming to some and persevere until an IT issue is resolved to the Client's satisfaction. Clear communication and delivery is their top priority. This website has a very rich colour scheme; the white and cherry red suggesting luxuriousness whilst evoking the professionalism of a business card. This is a good example of how a unique colour scheme can really make your website stand out. It can then be used across all further representations of your company such as online extensions like blogs and email signatures or even print articles like brochures and letterheads. Having a colour scheme in mind, though basic, can go a long way in helping Website Designers understand the feel of your company and then create a complimentary design for your website. Finally, the clients requested a Blog Set-up during the build process of www.seymourhosking.co.uk. This is a great way of propagating interest among existing and potential clients alike while improving the Search Engine Optimisation of the site through a series of steady updates. When Toolkit Websites sets up a blog for you, we do all the hard work of organising the account and linking it to your main site. We also alter the layout of the blog so that it fits in seamlessly when navigated. There are many advantages to having a blog. For example, you will have access to other useful tools such as an archive menu and the ability to add labels to make your blogs a well of searchable information. There is also the option to allow comments from readers thus giving your company the opportunity to receive precious feedback from your intended market.